While we had another bizarre rules moment Thursday at The Players, Harold Varner’s troubles had little to do with the new rules, just a complex and freakish run-in with an old rule related to club adjustability. But it’s worth noting that even after a bizarre violation we are not seeing the usual outpouring of grief over the change. That’s a direct result of PGA Tour Commissioner Jay Monahan reiterating and expanding on a recent memo making clear the PGA Tour has no desire to make golf rules. My Golfweek story on that, and the key kumbaya quote after a two hour five familes meeting. In between talking Abraham Lincoln and Arnold Palmer, Rory McIlroy took the high road on the beleaguered new rules of golf. And the people who worked over many years to simplify them. I was starting to wonder if PGA Tour Commissioner Jay Monahan enjoyed seeing his players bash the governing bodies over the new rules given his public stance against the R&A and USGA over distance. A position which has added to the disharmony as it suggested to players that the governing bodies are looking to take your hard-earned distance and hard-earned endorsement dollars away. Maybe he saw Charl Schwartzel unnecessarily berating a PGA Tour official at the Honda or read some of the absurd player comments directed at the new rules. The problem is that Tour players seem less interested in providing insight than in shifting blame. Maybe it was Justin Thomas’s Twitter exchange with the USGA. Maybe Michael Bamberger’s admonishment of all involved did the trick. Just ask yourself, before you open your mouth or Twitter account: Are you about to make the game better? Are you putting the game first, or yourself? Fowler failed on Thursday. The USGA failed on Saturday. It was all so inane it makes you want to scream. Maybe the accountants finally delivered an updated estimate on Foster and Partner’s new PGA Tour HQ building and realized there’s nothing left to administer the rules, much less enforce them? Maybe Monahan was touched by R&A Ambassador Padraig Harrington’s defense of his friends in the rules world or the comments of Thomas Bjorn, a Ryder Cup winning captain who knows everything after guiding Europe to victory. Maybe he saw this fight among grown men in flip-flops at a South African course over cheating and realized it looks a little like his players squabbling with the governing bodies? Or maybe he read the absolute gibberish being churned out by some of his players on Twitter. I believe Matthew is saying PGA Tour referees are supposed to ignore the rules as written. What could go wrong! Knee height is fine. Flag stick in is fine. Tapping down spike marks is great. Caddie accidentally being behind you at some point during your setup resulting in a penalty is asinine. Every penalty assessed since the rules changes, the player gained no advantage. Yes, Patton not getting in the U.S. Open is exactly the reason to throw out the new rules! Brilliant! Whatever it was, Monahan issued a memo to PGA Tour players reported on by GolfChannel.com’s Rex Hoggard essentially telling the lunatics in the asylum to pipe down. There are two columns from the Honda Classic worth noting as they ultimately have players ripping the revamped Rules of Golf for both selfish reasons and also somewhat logical ones. Randall Mell took the occasion of Rickie Fowler’s deuce drop to highlight Justin Thomas’ complaints about the change in replacing a broken club, a very first world PGA Tour problem that would not impact most golfers. “I think they’re terrible,” Justin Thomas said. That’s what he told media the day before the Honda Classic began. His opinions only hardened in the first round, when he bent the shaft of his 9-iron, hitting a tree with a shot at the 10th hole. The new rules wouldn’t allow him to replace the club, the way the old rules would have. Unable to repair the club, as new rules allow, he played the final eight holes with 13 clubs. Thomas said he probably couldn’t have replaced the 9-iron in a timely fashion anyway, with his backup at his Jupiter home down the road, but it’s the principle. “You can just add that one to the list of rules that don't make any sense,” Thomas said. Again, a first world one but understandably important to professional golfers who play a different game for a lot of money than the rest of us. Player frustrations over the new rules were a topic of conversation in a mandatory players’ meeting at PGA National this week. Tour commissioner Jay Monahan presided. Players fear other controversies may be lying in wait. While incidents of player ignorance are not the fault of the mostly-excellent and streamlined rule modifications, there is no getting around the optics. By starting the year with major changes in the heart of the season and without significant field testing, the result has been mockery. The precious M’s aren’t always right nor should their views supercede all others, but the notion that players are hearing from friends how ridiculous they look will ultimately undermine the rules if not addressed. Which strikes at the ultimate issue here as it’s been for all too long: the governing bodies have always struggled with the notion of someone making a living playing the game. And heaven forbid, people like them more than the amateurs. “My buddies at home are making fun of these rules,” he said. “People in the greater word of golf are making fun of them. Some of [the changes] are good, some of them are bad. Which is why, ultimately, these rules needed more field testing and a gradual rollout to help educate all or work out kinks. But given the difference in tournament golf today versus the everyday game, and the resulting taint which could offend new players to the sport, we are increasingly seeing why splitting the rules makes sense. Anyone for Golf Channel’s relaxed rules for the rest of us while the tournament golf world sorts all of this out? Even though we’ve seen this movie before: eliminating fairway at the Old Course to mask regulatory ineptitude, the retirement of Chief Inspector Peter Dawson seemingly put an end to that madness. Turns out, his replacement has signed off on an enhanced rough harvesting effort to combat the surge in driving distances at the home of strategic golf, the Old Course. Who knew there was any more rough to grow or fairway to eliminate at the Road? While most understand the Road hole’s strategy and the visual and angle issues caused by bailing out left off the 17th tee, the R&A has begun adding more rough to “enhance” strategy by offering hack-out rough. From John Huggan’s Golf World report after Martin Slumbers’ day with reporters this week. Specifically, Slumbers indicated that the rough left of the 17th fairway on the iconic Road Hole will be enhanced in order to force players to the right, closer to the out-of-bounds. The grass on the bank left of the 14th fairway and right of the fifth will also be allowed to grow longer than ever before. Also do not discount how much gorse has been allowed to remain to “defend” the course, on top of tee boxes on the neighboring courses, something Old Tom Morris worked to rid the place of and which was instrumental in the course’s increase in strategy and enjoyment. But it’s the notion of taking a shot away from a player, or disallowing a ball to run to a disadvantageous location at the Old Course, that speaks to a special level of absurdity. Particularly given Slumbers’s suggestion that the growing effort has already begun, meaning everyday golfers will have to suffer more for one week every five to six years. What a bleak and cynical vision for the most important and cherished links, and all so that a few people can avoid doing their job as regulators. His English teachers will be proud that R&A Chief Martin Slumbers is sticking to the proper definition of “rota” that actually references a fixed rotation of courses. And with both Turnberry and Lytham on the bypass list, they are not in a rota. But not out of the Open rota. Or whatever it’s called. Will Gray for GolfChannel.com included this quote. He’s not wrong! Well, maybe except the Turnberry under consideration part. "Turnberry will be in consideration for 2023, but it's not a rota," Slumbers said. "We look at all the issues in the round, but Turnberry remains as one of the 10 courses where we could stage the Open Championship." Could A Review Of Performance Enhancing Flagsticks Prove Fatal For The Governing Bodies? To review: golfers can leave flagsticks in the hole without penalty, pro golfers have convinced themselves that they will make more putts, fans can see the hole easier, and unlike some of golf’s new rules, there is nearly unanimous support for this change before a majority of golfers have even tried it. But with the R&A’s Martin Slumbers’ comments this week, combined with the USGA’s Thomas Pagel having said something similar to the WSJ’s Brian Costa, both organizations have suggested that should there be signs the new rule is enhancing performance and de-skilling the game, they might have to revisit the change. Slumbers is right, this is not the time. But even if this one does pan out to somehow allow a few more people to make more putts, rescinding this rule might just be the undoing of the governing bodies. After all, might most wonder why the possibility of performance enhancement was not investigated before making the rule change? While USGA CEO Mike Davis sees the revamped rules rollout as a “huge success”, his counterpart at the R&A offered a different view Tuesday. From Alistair Tait’s report at the chief’s St. Andrews sitdown with writers. That’s a rather stark difference from Davis’ position, but also a more credible one that will resonate with most golfers. He also defended the knee-drop situation. It’s hard not to see a return to Royal Liverpool in 2022 as a sign that Royal Lytham and St Anne’s days in the rota are numbered given space issues and a lack of length. Hoylake last hosted in 2014 while Lytham last welcomed the world’s best in 2012. With The Open at St. Andrews in 2021 there was only a chance of back-to-back playings in Scotland, albeit it a slim one, meaning Trump Turnberry remains waiting for its first Open since 2009 and first R&A event since 2012’s Senior Open. 26 February 2019, St Andrews, Scotland: The 151st Open will be played at Royal Liverpool (Hoylake) from 10-17 July 2022. The occasion will mark the 13th time that golf’s original championship has been played over the famous links where many of the greatest names in the sport have lifted the iconic Claret Jug. The Open was last played at Hoylake in 2014 when Rory McIlroy famously completed a wire-to-wire victory by two strokes over Rickie Fowler and Sergio Garcia to become the third golfer from Northern Ireland, after Fred Daly (Hoylake,1947) and Darren Clarke (Royal St George’s, 2011), to win the Championship. More than 230,000 fans turned out to watch Tiger Woods lift the Claret Jug for the third time in his celebrated career when The Open was played at Hoylake in 2006, which was a record attendance for a Championship held outside of St Andrews until the total was surpassed at Royal Birkdale in 2017. Martin Slumbers, Chief Executive of The R&A, said, “The Open has a strong affinity with England’s Golf Coast and following the success of the Championship at Royal Birkdale two years ago we know that there will be tremendous excitement among golf fans at the prospect of its return to Royal Liverpool. Steve Rotheram, Metro Mayor of the Liverpool City Region, said, “The Open is one of the world’s great sporting events and it is great news that it is returning once again to our city region, home to some of the most iconic courses in golf, including Royal Liverpool. Leader of Wirral Council, Councillor Phil Davies, added, “We are thrilled to be welcoming the world’s best golfers back to Hoylake. The last time The Open was held on our peninsula our local businesses in Wirral and across the region enjoyed an economic boost to the tune of £76 million. “The impact of an event of this scale – the global profile, thousands of visitors – is just fantastic for everyone in our borough. Local shops, restaurants and every resident, I am sure, will already be counting the days to what is always a special occasion. Hoylake first staged The Open in 1897 when Harold Hilton, a member of the club, won the Championship for a second time after his maiden victory in 1892 at Muirfield. Since then, the historic links has witnessed some of golf’s most notable players go on to become Champion Golfer of the Year including Sandy Herd, Arnaud Massy, JH Taylor, Walter Hagen, Bobby Jones, Alf Padgham, Daly, Peter Thomson, Roberto de Vicenzo, Woods and McIlroy. You all may recall chief Keith Pelley chirping on behalf of outraged European Tour players at the sheer non-game-growing new rule that cost Haotong Li two strokes, though as I noted at the time you didn’t hear PGA Tour players griping because they clearly were more up on the new rules. And Pelley was taking his tour to Saudi Arabia, so a distraction card was also being placed on the table. One problem, the PGA Tour and the European Tour were all in on the new rules meetings, as was the PGA of America. Rex Hoggard at GolfChannel.com takes a tough but appropriate stance on any PGA Tour player and executive revisionist history. Although the Tour has had a voice in the rule-making room for some time, the USGA and R&A agreed to give the circuit, as well as the PGA of America, more influence over potential changes when the organizations found themselves at odds during the anchoring debate a few years back. The Tour, which is represented on the rule-making front by senior vice president of competitions Tyler Dennis, may not have veto power over potential changes but it does have a prominent seat at the table. For the Tour to dig in against the new rule, or at the least the rule’s ambiguous language, just as public opinion against it was poised to reach a crescendo, seems opportunistic if not duplicitous. Ultimately the mistakes lie in not having a soft unveiling of these rules and perhaps a few fall events to work out the kinks, not necessarily in the rules themselves. At least, most of them. Now that the governing bodies are working overtime to deal with the alignment rule after conceding a lack of success, the navy and grey slack set needs to clear more space on their emergency meeting agenda. How a ball may be dropped is simplified; the only requirement is that the ball be let go from knee height so that it falls through the air and does not touch any part of the player’s body or equipment before it hits the ground. The overall absurd look of the knee height concept can go any day now. It will not speed up the game. Or grow it. Meanwhile, the Forecaddie explains why you saw players consulting green books seemingly as much as ever at the WMPO. Because the change in spec allowances are not working according to Adam Scott. “I think the rule has not done anything to change their impact,” Scott said. But hey, the flagstick rule we definitely can keep! Why Have Golf's Better Athletes Only Picked Up 1.3 M.P.H. In Clubhead Speed Over The Last Decade? The USGA and R&A have released their annual driving distance report and the pro tour’s saw a 1.7 yard increase on top of last year’s 3 yard increase. Given how much we’re told the recent spikes are a product of increased athleticism—not equipment innovation or launch monitors or instruction—the gain of just 1.3 mph in swing speed since the players started traveling with foam rollers, eating raw cauliflower and taking their core work more seriously seems paltry. Compared to the earliest radar data available, which came in 2007, ball speed is up almost 4 mph, drives start 0.3 higher and with almost 200 rpm less spin. At the same time, the average clubhead speed on those drives has increased from 112.4 mph to 113.7 mph. This would indicate that while the pros on the PGA Tour are swinging faster as a group, their equipment and swings are becoming more optimized and efficient. Meanwhile in his Golf World assessment, Mike Stachura attempts to downplay yet another increase in driving distance across the board by ascribing a percentage decline to the increase. According to the report, the average increase in driving distance across all professional tours in 2018 was 1.7 yards over 2017. While that number is significantly higher than the trend from 2006-2016, it is more than 40 percent less than the gain seen in average driving distance from 2016 to 2017. More than 40%! Nothing to see here! Finally, the most interesting thing I saw in the report—besides huge spikes in drives over 320 yards powered by that 1.3% clubhead speed increase—was a yellow color coded admission that “stability through regulation” ended in 2016. Translation: our rules stopped working the last two years. Interesting choice of words. "Absurd" Has Insurmountable Lead In New Drop Rule Sweepstakes! The voting suggest the new drop rule is not going over well so far. 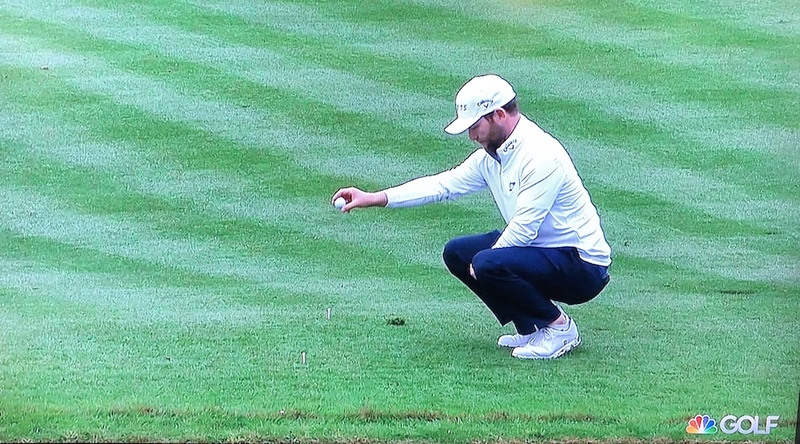 Michael Bamberger, senior writer: The knee-drop looks ridiculous. It exists for a very limited purpose, to stop multiple drops on slopes. I think the professor has it right: a better rule would be to drop anywhere from knee to shoulder height. “It’s not just a drop from knee-height, but now it’s a focus on the relief area. People say that dropping from shoulder-height is simple, and it is, but under the old rules, there were nine different times you had to re-drop. We wanted to eliminate all those complications,” Pagel said. Ultimately, however, the act looks awkward. Any player wanting to drop from higher up whether for personal, political or pure inflexibility reasons should be allowed to without the potential for penalty (which is incurred after playing a shot if the drop was not from knee height). The full release is here. Golfweek’s Brentley Romine has the highlights of the final announcement. Some of the changes made to the original proposal following the feedback period include the removal of: (1) the proposed minimum slope indication limit of 4% and (2) the prohibition against using handwritten notes to create a copy or facsimile of a detailed green map. Additions to the original proposal include: (1) a new size limit for the printed book/material (restricted to pocket-size), (2) a new prohibition against magnification of putting green information and (3) a new requirement that any hand-drawn or written information must be in a book or on a paper meeting the size limit and must be written by the player and/or his or her caddie. Reading Mike Stachura’s Golf World account, the author sounds pretty skeptical of Thomas Pagel’s claims on behalf of the USGA suggesting that the limitations will still limit these books in competition. The new interpretation, however, seems to shift from some of the original proposal’s fundamental convictions. In July, Pagel said, “Basically, the books are giving them a recommended line, and that goes too far. The skill of reading a green was diminishing, quickly going away. And we wanted to make sure it was retained.” But there were two factors that seemed to sway the decision away from specific restrictions on the information in any green-reading book. One was history, and the other was enforcement. Will this turn out to be another anchoring ban that ultimately leaves people wondering if players are skirting the rule? I hope not. The USGA/R&A distance survey is a bit like a Robert Trent Jones design: needlessly long, seemingly takes longer to get through than you think, isn’t the most rewarding experience and you’d never do it again. But unlike some tired old RTJ effort, this one really won’t cost you a dime and will entertain at times if you are intrigued by reading between the lines or general survey construction. If you have a few minutes, please share your thoughts no matter your place in the game. In fact, the governing bodies have made a special point to let every day golfers know their input is most valued. It took me about 12 minutes to complete, sparing them of any Max Behr copy and pasting or Statement of Principles jabs. I figured those would not be productive roads to take. Here is the USGA version of the distance survey, and the R&A version can be found here. As the USGA and R&A rolled out the actual written Rules of Golf coming in 2019—please give them clicks, much editing went into this!—Golfweek’s Alistair Tait asked the R&A’s David Rickman about the proverbial elephant in the room: spike mark tapping. While spikes are virtually gone, the idea that players can massage their line continues to not sit well with many, including yours truly, who is struggling to reconcile playing the ball as it lies while being freed up to manipulate the ground between your ball and the hole. Besides the philosophic disconnect, Tait zeroes in on the past lessons learned from allowing spike mark tapping on the European Tour and Rickman says times have changed. “It was an area in the extensive discussions that we talked about for some time because in all of this we were interested in speeding the game up, and this change in particular could potentially even go the other way. But what I would say is that it does present a completely different dynamic,” he said. I don’t. And this is someone who believes in Rickman’s views on the rules. Primarily, I just can’t see how you can instill a “play it as it lies” mentality in today’s players or future generations when you can now make it lie on the greens. They already complain when all 18 greens are not of the same firmness and speed, and providing a free-for-all to manicure lines seems like less of a slow play issue and more of a core value undermining problem. Certainly a case could be made that introducing spike-mark tapping could have alleviate pressure on supers to present perfect conditions. But the first time you watch an elite player turn golf into curling by massaging their line, I’m confident you’ll miss the old play it as it lies days. Stories recommending how to make the U.S. Amateur more relevant have been written for some time now. Doug Ferguson wrote this one back in 2005 that I blogged about. I penned a Golfweek story last year suggesting that U.S. 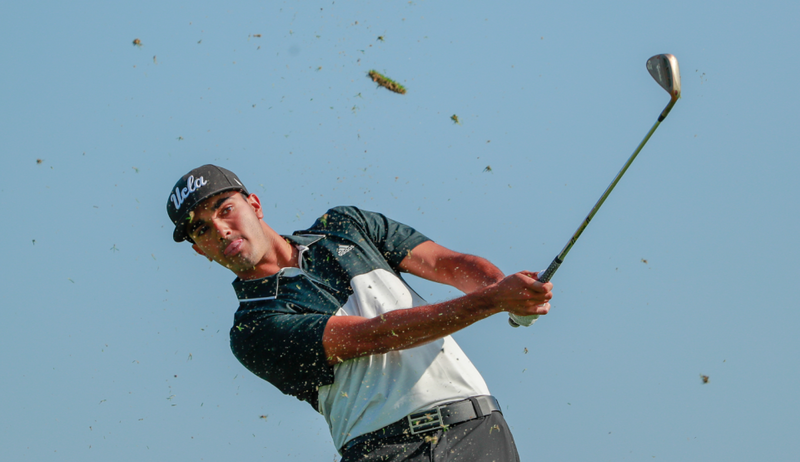 Amateur winners retain their U.S. Open exemption whether they turn pro or not. Once counted as a major by Jack Nicklaus and a vital championship on the golf calendar, the U.S. Amateur has drifted to the back pages and in the ratings division. The amateur game has been weakened by few lifelong amateurs and players turning pro at increasingly younger ages. But after last week's U.S. Amateur, I'm convinced the event is also undermined by players looking like pros. Maybe it's too subliminal and maybe the trend is irreversible, but I was struck by how many people noted when a player wore a corporate-affiliated hat or looked too much like a professional golfer. College gear didn't seem to offend even though some of America's finest institutions might as well be corporations. Seeing a player advertising their school reminds us they are still an amateur. But young players looking like PGA Tour pros, down to scripted outfits and an overpolished look envisioned in a corporate meeting room, strips the event of its integrity. Yes. Even if you have golf skill or reputation, you may accept a reasonable amount of golf balls, golf clubs, clothing, shoes and other merchandise from a company or source dealing in these types of equipment (e.g., equipment manufacturer or golf shop). However, if you are considered to have golf skill or reputation, you must not advertise or promote the source of the equipment. The act of wearing a scripted, logoed outfit and hat would seem to fall under the definition of advertising or promoting the source of your free equipment. Particularly the hat. The USGA did once try to regulate the logos, according to former Executive Director David Fay, who recalled amateurs at the 1989 event even being asked to cover manufacturer logos with duct tape. The USGA even offered the amateurs who made it to the TV rounds a free host-Club logo hat. "But it all started to feel (and look) silly to duct tape “Titleist”, when more and more 15 handicappers started wearing equipment-manufacturer hats and carrying equipment-manufacturer bags and head covers," says Fay. Indeed, golf has the equivalent now of cyclists who stumble into Starbucks in the logo-clad tights, as if they'd just finished the Bourg-Saint-Maurice Stage in the Tour De France. Logos are pervasive in our culture and even an attempt to look stylish or to subscribe to some sort of lifestyle brand. Nonetheless, amateurs sporting their preferred manufacturer's logos as a thank you for free equipment constitutes advertising as defined by the Rules of Golf. Worse, the look undermines the amateur in United States Amateur. Bring back the duct tape. Matthew, winner of the 2009 Ricoh Women’s British Open, feels the governing bodies have waited too long. “I kind of think they’ve got a little out of hand,” Matthew said. Stracka: Putting Stats Haven't Changed So Why Curtail Use Of Books? Kind of like the folks who say the ball isn't going longer and advertise a new longer flying golf ball, Jim Stracka is treading that fine line in saying a product his Strackaline sells hasn't made a dent in putting stats, yet can't understand why the USGA and R&A want to curtail green reading book usage. Which begs the question: if they haven't impacted putting numbers, then what is being sold other than a tool that slows down play, appears to cut down on the importance of local knowledge and experience, while enriching a few?